My name is Dimitris Drikakis. 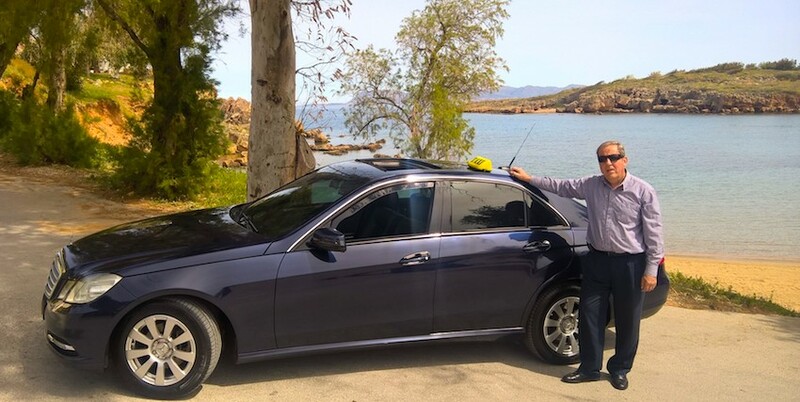 I'm a taxi driver in my hometown of Chania, on the island of Crete, just like my father was before me. I never meant to become a taxi driver. My father had high hopes for me when I left Greece to study finance in Italy in the '70s. That dream was shattered when he developed throat cancer and I had to return home to care for my parents, as an only child. (And of course, I don't smoke.) I don't have any regrets about the way life took its turn for me. I could have done any job I had to do, to ensure that I could take care of my parents and subsequently my own family. Whatever job I decided to choose, I would do it well. I chose to do what my father did because, in those days, that's what we Greeks did. So I think I am one of the best taxi drivers in Greece. I've been driving a taxi for a living since 1981, just after Greece joined the European Union. Before that, Chania was a sleepy dusty town, often overshadowed by Iraklio, the biggest city on the island of Crete. But the '80s changed everything. Chania keeps breaking its own tourist arrivals records: in 2017, nearly 1.5 million people visited my town. This is one reason why I love my hometown. If people who aren't from here love it, I know it must be very special. Even during the economic crisis, my New Zealand-born wife insisted that we stay in Chania. As I mentioned, I have no regrets. Our family, our hearts and souls are all here. Life in Greece these days is sometimes difficult. Taxi fares are low, gas is expensive, and a lot of people do the same job as me. One year never really predicts how the following year will go. But some things remain stable. I am thankful for the Greek sun, the Cretan sea, my green fields full of oranges and olives (I'm a part-time farmer too), and above all, the good health of my family. As we Greeks say, υγεία πάνω απ' όλα (health above all things). I don't think I am just another taxi driver in Greece. I'm highly conversational (I speak English and some Italian). Having lived in Chania all my life, I know this town really well, including its secrets, things you will never read about in guide books. I love sharing these stories with strangers. I know the history of my town, my island and my country very well. And because I like to work with interesting people, I also work with various companies that match passengers' needs with appropriate drivers like myself, doing transfers from the airport, hotels, cruise ships and ferry boats. I am available for all these services and also to drive you to the top of the Samaria Gorge and pick you up when you are through. I'm able to organise (and to help you to organise) any trip in Crete that interests you. I have my own special style of introducing the sights of my town, especially the not so well known ones, to all my passengers, and I suppose they must like what I tell them, because I am often asked back by them. Chania is not just about what is on the map. That's where all the tourists go. I like to include places in my itineraries that reveal other aspects of my town. I can take you to a quiet beach, a popular beach, a beautiful beach - any kind of beach that interests you. Not interested in beaches? I can take you to see beautiful scenery, dramatic scenery, awesome scenery - just tell me what interests you. And before I forget, I'm a gourmet of Cretan cuisine. I know the best places to eat the best food that Crete has to offer. The Mediterranean cuisine is based on fresh seasonal local produce - it isn't based just on meat. So if you're a vegetarian, I can explain some of our favorite dishes. Wherever you go in Crete, you will find fantastic food in beautiful villages off the beaten track, so you don't have to feel like herded cattle (Crete gets very busy in the summer). I drive a Mercedes, fully air-conditioned and very comfortable. I drive very carefully, I don't smoke, and I'm very clean. I hope that, after taking a drive with me, you will understand my country better than when you arrived here. My hope is that when your holiday is over, you will want to come back here, and tell your friends about it. FYI: My prices are based on the destination (mileage) and the amount of time the taxi is in use on a single trip or tour booking. My taxi seats four passengers and I am not allowed by law to accept more people in the cab. I offer baby seats for safe transportation of youngsters. I don't do guided tours of archaeological sites or other places (because this is not my job – only registered guides can do this in Greece). I just tell you everything I know. If we can't accommodate you, we will try to find someone like us (reliable, honest, clean, excellent driving skills, polite) who will be able to service your needs. Wishing you safe and happy travels in our hometown. This contact form below goes to my wife Maria. She is tech-minded, super reliable and extremely organised. Without her, I would be nothing. (She often reminds me of this.) I let her deal with all the bookings, because she is really, really good in administrative work, in consultation with me. This lets me concentrate fully on being the driver I want to be, which is of course the best driver. We are the best taxi team you can get in Crete.